Why is this iconic Australian tree named after an order of Tuscan monks? It was a fine and warm November morning in Florence and we were boarding a bus to the city of Poppi, a two hour journey east through a beautiful region of Tuscany. It was a hair-brained scheme of mine and not well planned. In fact there was no plan, simply a noble idea to track down the place where the iconic River Red Gum had been named. I had always been interested in the origin of botanical names partly because it helped me remember the often complex sounding words, but also there was always a hint of a story behind many of the names. For instance the River Red Gum is the only eucalypt that is found in every mainland state of Australia yet it was named after a monastery in Italy. That information alone was intriguing enough to make me want to take a leap into the unknown after visiting our children who were now living and working in London. 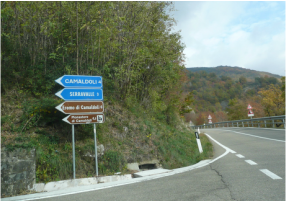 My first attempts to contact the Hermitage of Camaldoli had been a complete failure. I had emailed several times from Australia but had had no reply. When I asked in Florence about a bus to visit the famous antica farmacia (a pharmacy where they sold only handmade natural remedies prepared by the Camaldolese monks), which is in the grounds of the Hermitage, I was told that the mountain road was too dangerous at this time of the year and the bus wasn’t running. So that was that and I scalded myself for not planning and researching this adventure more thoroughly. However a lucky conversation in Italian between my wife Lina and our B&B hostess changed all that. We were staying in a grand family home which offered a comfortable B&B and Lina mentioned our predicament at breakfast. Remarkably our hostess know someone at the hermitage and would make a call for us. She did this while we had our coffee with bead rolls and jam and yes they would be happy to accommodate us at the hermitage for two nights. A monk would even meet us in Poppi and drive us to the monastery. We couldn't believe our remarkable change of fortune. The deciduous reds and yellows of beech and oak trees and the greys and greens of the Tuscan Pines. The 40 kilometre bus trip to Poppi took us through the breathtakingly beautiful Apennine mountain range coloured with the deciduous reds and yellows of beech and oak trees and the grays and greens of the Tuscan Pines. The mountain views were imposing and magnificent so the two hour journey passed quickly. The bus began to slow as we entered the large town of Poppi and we drew to a stop. As the door opened we could hear the pleasant Italian tones of “Gli Australiani”. Father Ugo a small man in his fifties was our driver and guide for the 30 minute drive up into the mountains where the Hermitage was first built over 1,000 years ago. Ugo and Lina spoke italian as we wound our way up the steep bitumen road and I could sense that she was becoming more and more uneasy with the conversation. She was beginning to realise that Father Ugo thought that we were someone else. Apparently an Australian from Melbourne had written to the Hermitage ten years before asking about the origins of the River Red Gum and he had felt guilty for never replying to the letter. When our hostess had rung and spoken to him about Australians curious about the same question, he thought that it was only fair to see this person who had travelled so far to get a reply. Later that evening when this misunderstanding had been mellowed by a meal of pasta and a very good chianti made by the Benedictine brothers, we discussed with the monks the question that we had travelled so far to have answered. I had already began to realise as we drove up into the mountains to the ancient hermitage that this place couldn’t be where the story of the River Red Gum had begun, though I did hope that I might find some clues to help me discover the true story. Our conversation was with Ugo and a Chinese monk who spoke a little English. We had moved from the large oak lined dining room to have coffee in another room that was decorated with many artworks depicting religious scenes. Feeling considerably out of our comfort zone with these two very pious men in this ancient room full of Roman Catholic history I tentatively raised the seeming inconsequential topic of River Red Gums. There was an awkward pause until Lina explained my question to them in Italian. Oddly it was the Chinese monk who explained that the Camaldolese order of monks had built a new hermitage in the rugged mountains east of Naples in the 1500’s. Unfortunately the monastery was no longer a hermitage, but this may be where the River Red Gum was named. The dryer hotter climate around Naples would certainly have been more suitable to the Australian tree I thought. He also suggested that the Botanic Gardens in Naples may provide some answers. 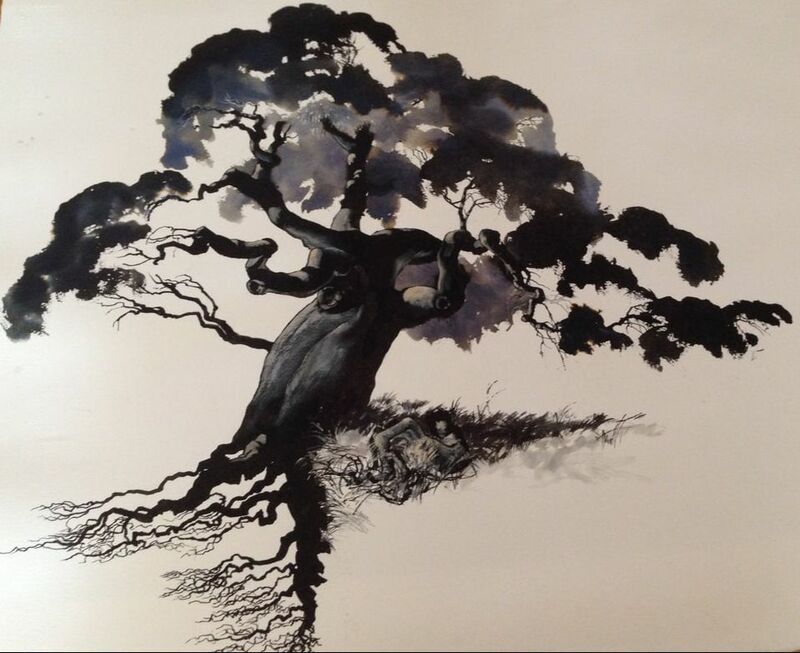 Ugo then ‘miraculously’ produced a letter and a photograph from the Australian that had written a decade before which described and depicted a 400 year old River Red Gum growing in a courtyard in Portugal. The mystery and questions surrounding this iconic Australian tree and a possible link with Portuguese explorers of our southern continent was a fascinating and unexpected twist. For the next two days we became immersed in the monastic life, attending vespers with the chanting of the hermit monks, sharing their evening meal and excellent wine, being shown around the hermitage, the beautifully frescoed library and the austere quarters of the hermit monks by an Australian Anglican priest who had lived there for the past ten years. Early the following morning we packed our bags and Father Ugo drove us to Arezzo in the company of a chatty Indian hermit nun. We thanked him with a donation that we hoped would cover the cost of our stay and any inconvenience that we may have caused the monks at the hermitage. It was five years later on a visit to Naples that we discovered that it was the distinguished Italian gardener/landscaper Frederick Denhardt who had propagated some River Red Gums in 1818 with seed that had been collected and sent by Allan Cunningham the Kings Botanist in the new colony of New South Wales. Denhardt had been contracted to develop a garden for a local nobleman who had been gifted some of the Camladoli Hermitage lands by the new Bourbon Government. Frederick Denhardt’s River Red Gums grew so well that he described and named the species, Eucalyptus camaldulensis after the Camaldolese Hermitage where the trees were planted. His description appeared in the 1832 edition of a catalogue which recorded the names of all the species growing in the gardens of Camaldoli. Sadly his work was overlooked at the time and the River Red Gum was named E. rostrata by the NSW botanist, Diederich von Schlecterindahl in 1847. The story becomes even more muddied when the botanical authorities at that time declared Schlercterindahl’s name was invalid because it had already been given to the Swamp Mahogany Gum in 1797 by a Spanish botanist. The River Red Gum was then renamed E. longirostratis (ancient Greek for the long point or beak on the cap that covers the developing flower) by the government botanist for Victoria, Ferdinand Von Mueller in 1853. In 1922 the 104 year old River Red Gums planted by Frederick Denhardt were sadly cut down and the Camaldoli gardens near Naples that he had designed and planted were abandoned. The reason for their removal isn’t clear but early reports of the trees indicate that they were vigorous and healthy, so it’s disappointing that this part of Australia’s botanical history has been lost. One hundred and two years after Denhardt published his description and name and ten years after the River Red Gums in the Camaldolese Hermitage gardens were cut down, researches in the Natural History Museum in Vienna came across a dusty 1832 edition of the Hermitage gardens catalogue. Finally justice was done when the 'rule of priority of publication' determined that Denhardts original name, documented thirty one years before Von Mueller’s, should be restored and River Red Gums would be known as Eucalyptus camaldulensis.